In Brawl Over Romney's Tax Returns, Harry Reid Gets Marquee Billing : It's All Politics Republican presidential candidate Mitt Romney is taking fire from the Senate majority leader over his decision not to release more of his tax returns. In Reid, Romney is up against someone who's not on the ballot and clearly enjoys a fight. 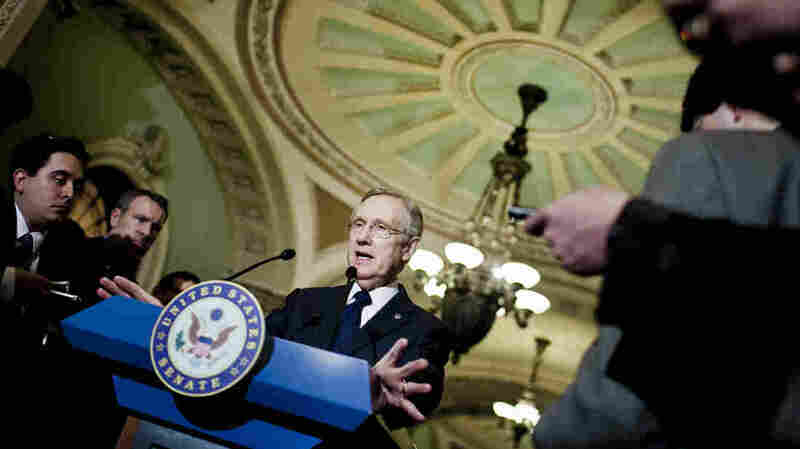 Senate Majority Leader Harry Reid, D-Nev. speaks to the media at the Capitol in March. Republican presidential candidate Mitt Romney's decision not to release more of his past tax returns has fueled countless attacks and counterattacks. The former Massachusetts governor has released his 2010 tax return and promises that his 2011 return is forthcoming. He says that's enough. But that's not enough for Senate Majority Leader Harry Reid, D-Nev. The result is an increasingly ugly fight. Reid has been making allegations about Romney's taxes for a while now. Almost a month ago on the Senate floor, Reid spoke of Romney's father, George, who released 12 years of tax returns when he sought the GOP presidential nomination in 1968. "Mitt Romney can't do that because he's basically paid no taxes in the prior 12 years," Reid said. That accusation was overshadowed by Reid's other claim that day — that Romney couldn't be confirmed as a "dog catcher" given his secrecy over taxes. Both statements were seen as classic Harry Reid. "Reid has a history of what we call in Nevada 'Reidisms' — sort of saying things that oftentimes he has to ... walk back," says David Damore, a professor at the University of Nevada, Las Vegas. Damore recalls the time Reid called President George W. Bush "a loser" or when he labeled former Federal Reserve Chairman Alan Greenspan a "political hack." But Damore says this attack on Romney seems different. "Usually, these are sort of one-line comments here. This seems to be more of a full-court press on Romney. He seems to see a vulnerability here, and keeps pushing it," Damore says. "Saying he had 'no problem with somebody being really, really wealthy,' Reid sat up in his chair a bit before stirring the pot further. A month or so ago, he said, a person who had invested with Bain Capital called his office. 'Harry, he didn't pay any taxes for 10 years,' Reid recounted the person as saying." Reid responded to the ensuing GOP cries of foul on the Senate floor last Thursday, saying: "The word's out that he hasn't paid any taxes for 10 years. Let him prove that he has paid taxes — because he hasn't." That same afternoon Romney was on the radio show hosted by conservative Fox News personality Sean Hannity. When asked by Hannity if he had a response to Reid's accusation, Romney laughed, then replied: "It's time for Harry to put up or shut up. Harry's going to have to describe who it is he spoke with, because of course that's totally and completely wrong." On the Sunday morning network TV talk shows, the topic was still hot. This time it was Romney's surrogates going on the attack against Reid. On ABC's This Week, RNC Chairman Reince Priebus said he wouldn't respond to Reid, calling him "a dirty liar." And with that, Priebus gave the storyline yet another boost. Romney himself has accused the White House and the Obama campaign of orchestrating Reid's comments. Jay Carney, President Obama's press secretary, has been peppered with questions about it. On Monday, Carney said: "I would refer you to Sen. Reid. ... Only Sen. Reid knows his source." But Carney was quick to point out that Romney's taxes first became an issue during the primaries, when his Republican rivals demanded that he release more of his returns. Damore says there's little incentive for Reid to back down. He's not up for re-election until 2016. "I don't think he sees any downside to this. Again, he's driving the narrative for these last couple of weeks," Damore says. And in doing battle with Reid, Romney is up against someone who's not even on the ballot, who most Americans don't really know and — as a former amateur boxer — who clearly enjoys a good fight.